Influencer marketing is best described by Lee Odden, CEO of Top Rank who says, “Influencer Marketing is the practice of engaging internal and industry experts with active networks to help achieve measurable business goals.” Over time, Influencer marketing has become one of the best methods for brands to reach out to their customers especially now that online advertising is becoming less effective as 47% of online consumers use ad blockers according to Digital News Report. Furthermore, a recent survey shows that, “84% of marketers said they would launch at least one influencer campaign within the next twelve months.” It is pretty clear that in 2017 brands need to move away from traditional online advertising and steer towards influencer marketing – however, let’s go from the perspective of an influencer or potential influencer. How can you keep track of your online influence? We may just have some tools which can help you. At the end of February, our marketing director Dixon Jones asked his friends on Facebook whether they’d like to be part of our influencer experiment and many obliged. In this blog post, we will centre the campaign on Ann Smarty and will compare her blog against other industry experts blogs as well as looking at her blogs Flow Metrics, what domains are linking to the blog and whether said domains are shared with other experts in her field. So first of all, let’s set up a Campaign to see how her blog stacks up against other industry experts. 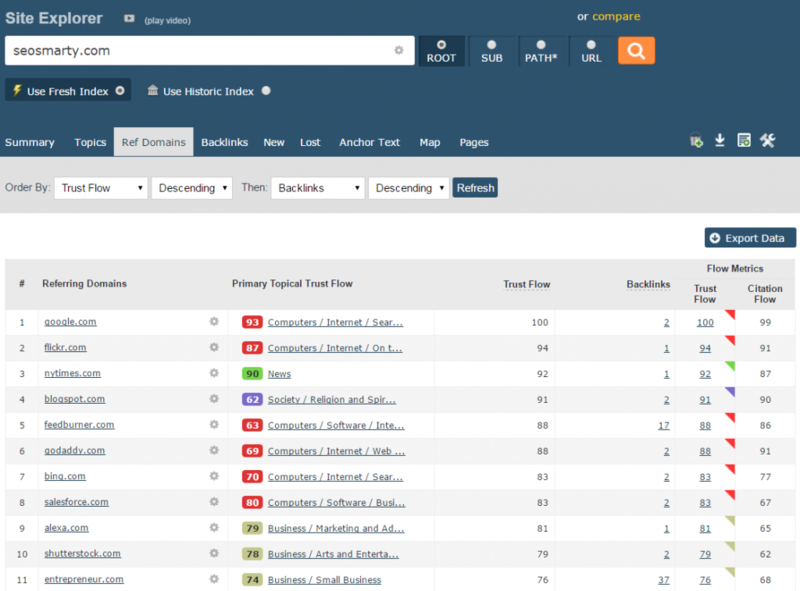 As demonstrated above, Ann’s blog Trust Flow isn’t as strong as the others in the list however, it ranks second in the list for backlinks and third for referring domains. The comet trails seen in the second and third charts show how Ann’s blog has changed over a period of time, whether that be how many backlinks she has going to her blog or the Flow Metrics. To find out more specific data about Ann’s blog, we will use Site Explorer to look at the blogs Flow Metrics and what topics it is most trustworthy in. As you can see from the visualisation, the blog has a relatively good Trust Flow and it’s not a surprise its most influential topic is in Computers. 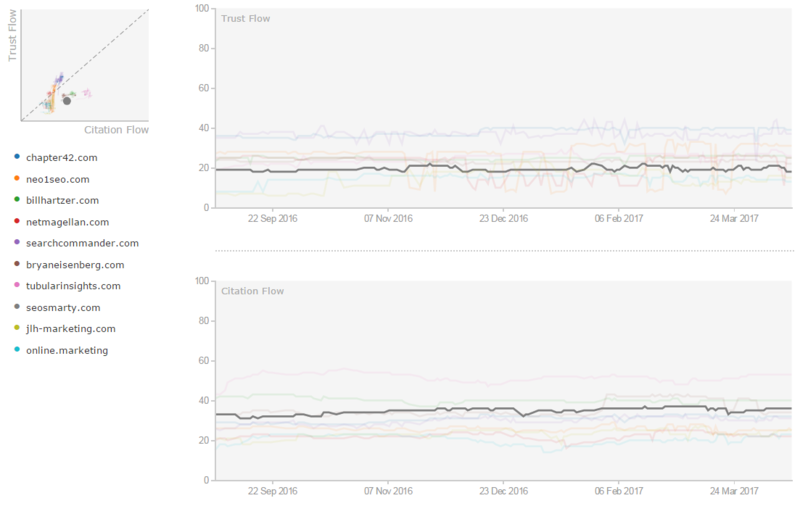 Whilst it’s interesting to find out the Flow Metrics of the blog right now, it would also be good to find out the Flow Metrics on a certain day in the past. 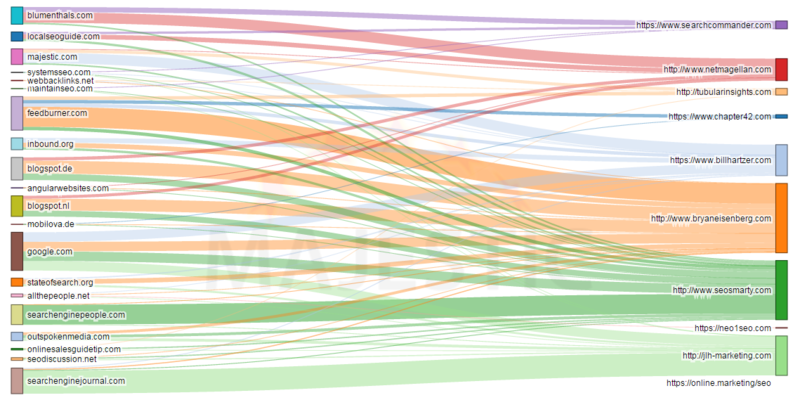 This is where our new tool comes in, Flow Metrics History. Flow Metrics history allows you to look at a websites Flow Metric on a specific date within the last 7 months and compare it with 9 other websites. So, how has the Flow Metrics of Ann’s blog changed since September? As the chart shows, Ann’s blog Flow Metrics haven’t really changed with highs of 22 on the 24th of November and lows of 18. One way we can find out why her blog had a high of 22 in November is by using BuzzSumo’s Backlink tab which allows you to see what articles are linking to your website as the image below shows. By setting the date range between the 21st and the 24th of November, we can see what articles played a part in Ann’s blog Trust Flow increasing and it’s clear to see that a mixture of guest blog posts and a link from SEMRush played a key role in it happening. Speaking of links, we now move on to the Ref Domains section of Site Explorer which allows us to see a number of things such as the most trustworthy domains linking to Ann’s blog, what domain is linking to her the most amongst other metrics. As you can see, Ann’s blog has a lot of links coming from entrepreneur.com which we all know is a huge influencer hub as well as links from the New York Times and Shutterstock. One of the best ways to increase your online influence is by guest blogging on influential websites in your field, so in Ann’s case it would be the likes of entrepreneur.com, searchjournal.com etc. It would be interesting to see if she has shared links with other influencers and we can use Clique Hunter to find that out. The Clique Hunter chart above shows the shared links Ann has with other influencers. It is no surprise that she and Bryan Eisenberg’s blog dominate this Clique Hunter chart as it correlates with the Ref Domains and Backlinks chart. It’s also no real surprise that a lot of the sites that link to these influencers are related to SEO. With a lot of backlinks and referring domains going to her blog, it’s safe to say that Ann’s blog is in a healthy state. However, influencer marketing isn’t just about a personal blog; it’s also about someone’s social media presence. In the second part to this blog post, we will compare Ann’s Twitter accounts against other influencers as well as using BuzzSumo to see how her content is shared on different platforms. Thank you very much for your article as marketing agency. We use your suggestions with our mojazavarovanja.si page and it works. Thank you Majestic!